Australians love affair with outdoor entertaining and the great Aussie BBQ has meant that the outdoor entertaining area has become a genuine extension of the home. An outdoor entertaining area is a fantastic addition to any home and one that can be used all year round. When it comes to creating your own outdoor area, you are limited only by your imagination. The range of designs for outdoor entertaining areas, and the huge selection of materials and products that are now available, means you can design a style of outdoor entertaining area that meets your needs and budget. Whether you are looking for an outdoor lounge, a functional kitchen, dining area, outdoor theatre or a combination of these, we can design and build this for you. Timber decking has many uses in the garden. It is versatile, and can be used for level, raised or sunken areas, with balustrades added for safety and visual effect. 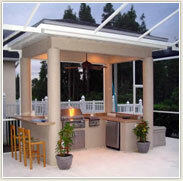 Garden patio decks have never been more popular, and are a great way to expand the living area into the garden. Together with this, there is a steady demand for the building of raised decks. Timber is a much better surface for all year round use and lends itself to all style of garden layouts when building a deck. Wooden structures such as arbors, outdoor kitchens and entertaining areas, decks, fences, screens and boardwalks add interest and a special kind of beauty to the landscape. With so many timber materials available timber features are easy to include in any design. 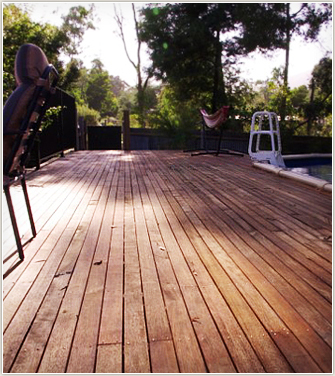 The use of natural timber in the garden adds to the natural beauty of the environment around you. Careful design and good quality construction will give a feature with so many years of enjoyment. Lighting is an important consideration when creating your outdoor entertaining area, as it is likely that a good percentage of your entertaining will be done during the night time hours. Not only will you need outdoor lighting so that people are able to safely find their way around your garden, it can also be used to create atmosphere. 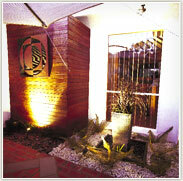 Garden lighting adds another dimension to your landscape. Your landscape need not be just for daylight hours. Lights can highlight features in your garden like tree trunks, walls, foliage, water features and decks. Lights can be practical, lighting paths for visitors and all your nighttime uses. Lights give that special ambiance to a garden after dark. Our lights are the latest technology LED, making them inexpensive to run, giving much longer lasting light than the conventional down-light. They are marine quality and waterproof. The transformers are small making them easy to be hidden. Our lights can also be operated by remote control. The right lighting not only enhances the look and feel of your garden it provides opportunities to enjoy your garden after dark.